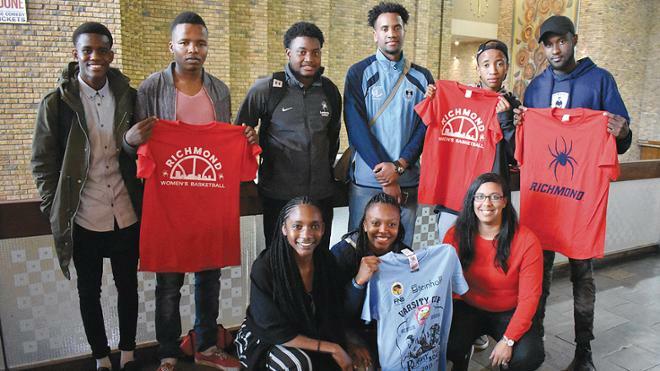 Athletics partnered with international education on a study-abroad experience for student-athletes. In mid-May, four Spider student-athletes found themselves talking to a man in a prison cell off the southern coast of Africa. The man was no longer a prisoner there, but he once had been. The facility was no longer a prison either, but now a museum. As they walked through, the man, now a tour guide, told them about the meager clothing, the miserable food, and other daily indignities of life there. Then they arrived at the cell of the prison’s most famous inmate: Nelson Mandela. This trip was one outcome of the university’s commitment to ensuring that the packed schedules of its student-athletes don’t prevent them from taking advantage of the opportunties available to other students across campus, including study abroad. The visit turned their thoughts to America's lingering difficulty with questions of race. Nearly 50 student-athletes studied abroad last year. The trip to South Africa and Dubai for these four students — Kevin Johnson, ’19 (football), Alex Parson, ’21 (women’s basketball), Marshea Robinson, ’19 (track), and Nick Sherod, ’20 (men’s basketball) — resulted from cooperation between athletics and the international education office, which also sent faculty to South Africa this summer. On their two-week trip, the students saw luxury hotels and impoverished townships, dense urban centers and expansive desert landscapes — and Robben Island, where Mandela was imprisoned for decades, becoming an example to the world of both antiracism and reconciliation. The visit turned their thoughts to America’s lingering difficulty with questions of race. In a blog the students wrote while abroad, the four students described the trip as life-changing. “Some things you just cannot teach, but you have to experience,” Johnson and Sherrod wrote.